Is there anything more perfect for spring than a Robins Egg Blue Easter Dress? Here at Storybook Cottage Mr. and Mrs. Christopher Robin have been very busy. It delights my heart to see such new life springing forth in our garden. This dress also makes me smile. I adore the full skirt. 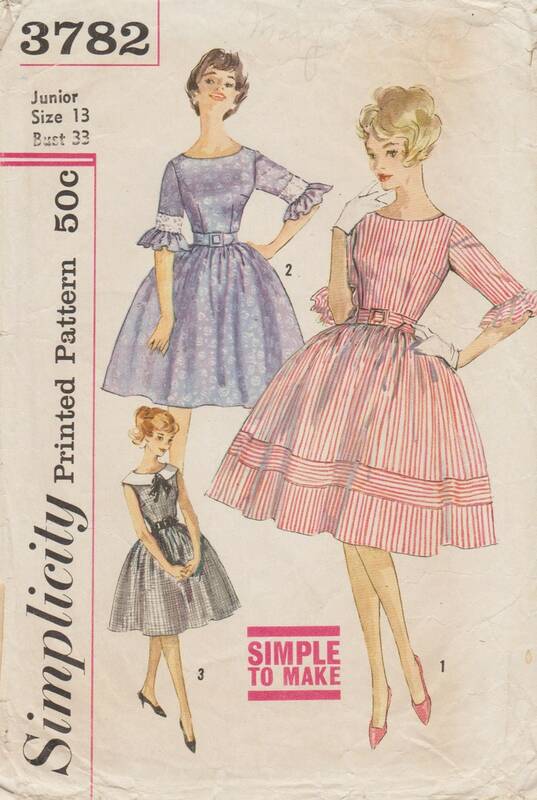 This dress is made from a vintage pattern, Simplicity 3782, view two. It states that it is “Simple To Make” and indeed it went together very smoothly. I may even make version three for the summer in a polka dot print. I do love the sweet ruffled sleeves. Such a sleeve has been in vogue once again for the past two years. A true design style classic. The fabric came from the vintage haul I found recently at an estate sale. It is a lovely cotton sateen that is a dream to sew and wear. The design reminded me of little eggs. Perfect for an Easter dress! Sweet Guy and I took the photos at our local park on a glorious sunny day. It was a bit windy though. Indeed when I bent over to gather up the eggs a big gust of wind surprised me. I popped right up and Sweet Guy caught the moment on film perfectly. I hope your Monday is full of smiles. See you Wednesday with fun Easter ideas. Such a pretty dress and the pictures are so cute. So pretty. That pattern is definitely in style and you did an excellent job making the dress. I wish we would get back to a trend of home sewn clothes. When I was a senior in high school I had a new outfit every Monday! I am reminded of my mother making most of our clothes in the 1960s and 70s. You have picked an eggcellent fabric.And I love the crinoline, one of the few items mom would purchase at JCPennys. You have all of the style of Jackie Kennedy, even the pearls, and the whimsey of the era. Some things are truly timeless. That dress is fabulous. Beautifully made and beautifully worn. Please don’t hesitate to wear it with sandals, I’m in Phx. and sandals are a given, as I know you recall!. Happy Easter to you and your family! Oh eggs, definitely! Great job sewing and the photos! What a delight seeing patterns/clothes from my teen years. I really appreciate your sewing skills! What a beautiful dress that looks divine on you! So sweet it has “eggs” on it — just like you said, perfect for Easter! You always amaze me, Friend! You look like a teenager, Laura. so adorable and great pics too! Fabulous dress and fun post! You look so pretty in your new dress! I love that shade of blue. And those were some great spontaneous photos! What a beautiful dress. Yes it is a perfect color for Easter or anytime in the season. I use to make dresses but stopped. You just gave me a push to start looking at patterns again. Have a great week! You’re so cute, Laura! Great job by your photographer! Darling photos, Laura! I love the sweet, feminine design of this vintage dress. Seriously adorable and you wear it perfectly! Absolutely love this!! Such a sweet pattern & the fabric is perfect for an Easter frock. You look adorable in it Laura! Happy Resurrection Day!! Looks like you were having fun and that is a beautiful dress. Thanks for sharing. Terrific post! I’m always in awe of your abilities, and this is no exception! What a cute take on a classic design and you look adorable in it!